You can explore with different triangles, try here. One interesting relation is the ratio between the areas try yourself with different triangles here. But we can also compare with similar segments using the fact that the midpoints of the side of triangles generate parallel lines. Let us prove that the new triangle EFG is similar to triangle ABC. EG = 1/2 AC, EF = 1/2 AB, FG = 1/2 BC since E, F, and G are midpoints of HA, HB, and HC respectively. EG/AC = EF/AB = FG/BC = 1/2. 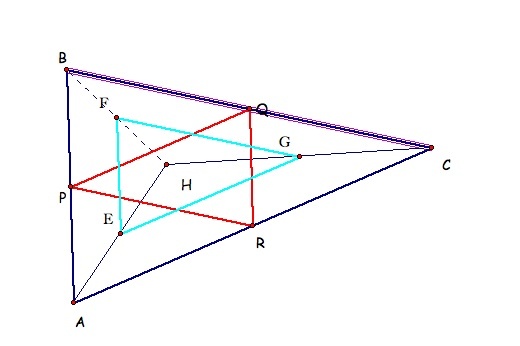 Therefore, triangle EFG is similar to triangle ABC since the ratios of the corresponding sides are equal (1/2). 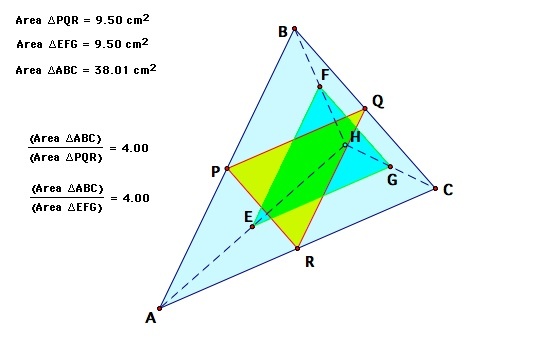 Now, let us prove that triangle EFG is congruent to the medial triangle PQR, of triangle ABC. So, we had found that the MEDIAL triangle is congruent with triangle EFG.